The tour de France has definitely got more people cycling. Quite a few think that you have to get a racing bike and wear Lycra. That’s fine. There are few enough excuses for men to wear skin tight pink clothing to pass one up when it arrives. But there has also been an explosion of people who want to use a bike for getting from A to B. Sadly, some manufacturers are trying to dig up any cheap parts they happen to have lying around, cobble them together, sticking a wicker basket on the front and passing them off on new riders. So here is a bit of help in choosing your bike. There are all types of bikes, just as there are all kinds of shoes. (Buying a bike is a bit like buying a pair of shoes). There are bikes for racing, bikes for cycling the south downs way and bikes for making cycle tours lasting days or weeks at a time. Just like shoes, its hard or impossible to find one bike that will do all of these. And just like shoes, you need one that fits you. Web sites have size charts, but in a bike shop you can actually try the thing on. For this sort of riding a bike shop is likely offer you either a “hybrid bike” or what can be called a “retro bike” because it is styled like a 1950s or older bike. Just as buying shoes is a thing I’d avoid doing on the internet, so buying a bike is not a thing to do on line if you can possibly help it. If you must, get a more experienced friend to advise you. A local bike shop is usually best. You are going to need to get someone to service your bike, just like you would with a car, so it is a good idea to start the relationship now. But beware of the shop trying to sell you a bike that they happen to have in the shop rather than the one you need. Be prepared to shop around. Obviously you should include the two Cycle Shack shops in Lewes (in Friars Walk and Cliffe High Street). I also like Mr Cycles opposite Seaford Station, and Freedom Bikes in Kemp Town Amsterdammers in Brighton under the Station sells traditional Dutch bikes. There are other good bike shops in Brighton. Search for “Brighton Bike Shop” Avoid Evans, who do not stock many bikes for beginners. If I bike shop is snooty with you, or dismissive of what you want, walk out. There are people working in bike shops who think you are not worth talking to unless you have actually competed in the Tour de France. There are enough good people around, so you don’t have to put up with this. If all else fails try Halfords. They are a large impersonal chain and used to have a poor reputation for service and rubbish bikes. But things are now getting a bit better and they do have a lot of bikes suitable for beginners. 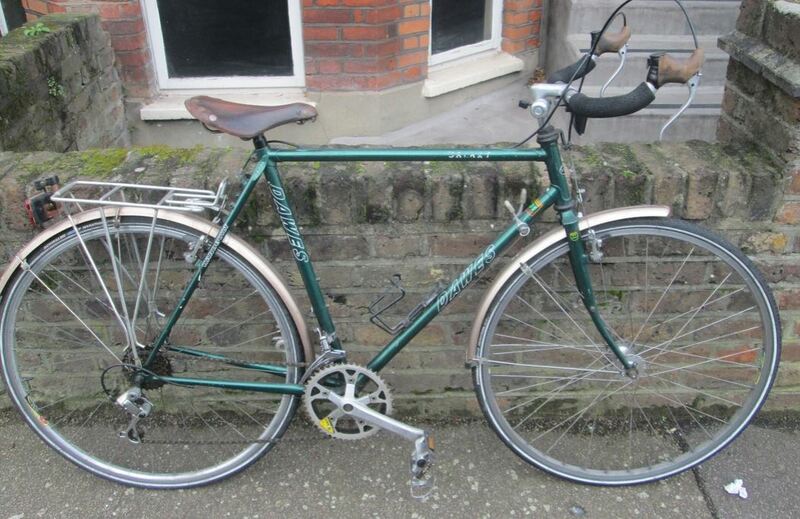 Second hand is always a possibility, but get someone who knows about bikes to help you. There are a lot of junk bikes about. A junk bike will just make you miserable and will end up rusting in the shed. For a decent new bike prices start at about £300. You can get a good bike for this, but beware of shops selling you a very basic bike and then making money piling the “extras” which you really need, like mudguards. £600 is the absolute maximum I would pay for a beginners bike. Many bike manufacturers bring out a new version of a particular model bike each year. The changes each year are very often cosmetic. You may be able to get a better deal on last year’s model if the shop still has some stock. Ask the bike shop about the cycle to work scheme, which enables you to reduce the cost of a bike by buying it through your employer. Every bike shop will have a hybrid bike range. They are sometimes sold as town bikes. They are called hybrids because they are a cross between mountain bikes and racing bikes and so are supposed to be able to do anything reasonably. This can mean that they do nothing at all well. They tend to have lots of gears, be reasonably light and can be made of poor components that the manufacturer has a lot of. Crucially they tend to have you leaning forward, putting more of your weight on your hands. This is a more comfortable position if you are riding for any time. The shop may also have what I call a retro bike range. Although some of these are cheap and nasty, they tend to be more well built, but they can be heavy and high geared. They have an upright riding position. This is very good for short rides, but after a few miles you tend to get a sore bottom, because you are putting all of your weight on it.- So you need a saddle with a lot of gel in it and/or a lot of springs. These bikes are often designed for flat places like Holland or Hull. You may have noticed that Lewes is not quite like this. Amsterdammers in Brighton specialise in this type of bike as do the British manufacturers Pashley who have been making these bikes since the last time they were common. If you really want this type of bike one of these two sources may be your best bet. Despite what fashistas and cycle couriers may tell you, gears are what makes the difference between cycling being fun and being a misery. You don’t need a lot of gears, but you do need the right ones. 5 good gears is better than 21 in the wrong range. 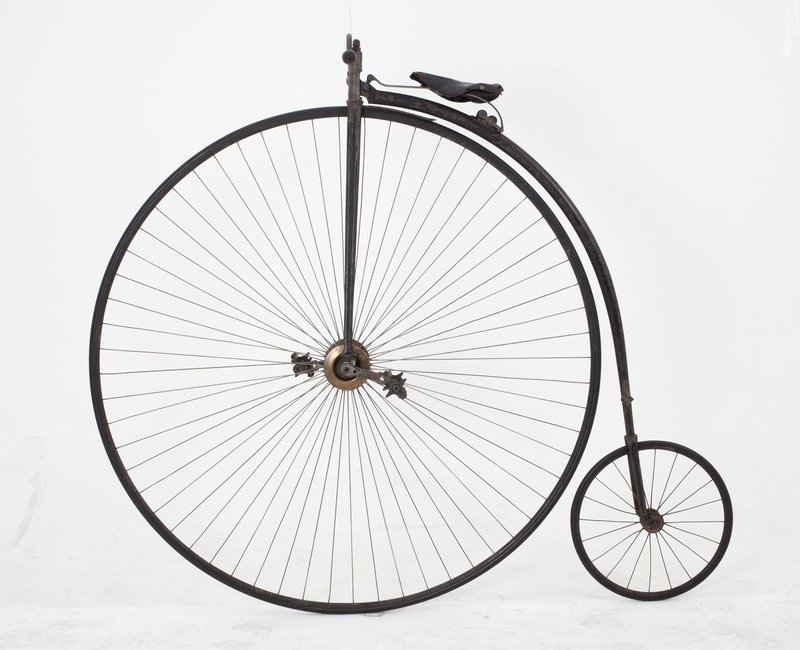 Quaintly, the British system of gearing dates from the Penny Farthing. These bikes did not have gears, but the larger the wheel on the front, the faster the bike went, and the harder it was to push. Gear ratios are expressed as the size of the ungeared front wheel you would need on a penny farthing to be in that gear. 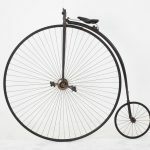 So 100” is what you would get if you had a 100 inch front wheel on this type of bike. 20” is a low gear, representing how it would feel if you had a 20” wheel on the front. You may find the bike shop contemptuous of gearing this low. They may call them “granny gears”. Be insistent. You may need to get them to modify the gearing since this range is standard only on some mountain bikes. This is quite a simple job, but may mean that you have quite a low top gear. Don’t worry about this. For a beginner, any gear above 80” is a luxury. If you are going this fast you can freewheel! If you later get fitter you can have the gears modified again. Gears are the key to cycling joy! There are hub gears and there are derailleur gears. Derailleur gears are those funny vulnerable looking cog things that stick out of the back axle. Hub gears are better. They tend to have fewer gears (5-7 is ok) but they are much easier to maintain and are less vulnerable to damage. They are more expensive, but go for them if you can, subject to getting a gear low enough. The lighter you are, the more important the weight of the bike is, especially going up hill. And more often than you think you will have to lift your bike up steps or stairs. Bike manufacturers are a bit coy about the weights of their bikes so you may need to email them to ask the weight of a model you are interested in. In a shop you can pick the bike up and get a feel for it. A hybrid bike should weigh about 12-14 kilos, although some weigh more. 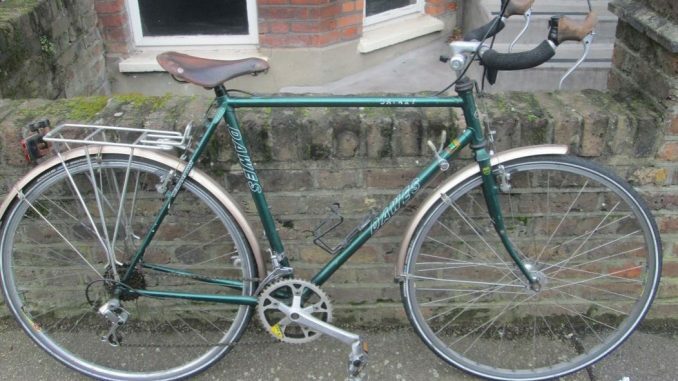 A retro bike can weigh as much as 22 kilos. Personally I would not buy a bike that weighed more than 15k. Bikes get nicked anywhere, but Lewes is nowhere near as bad as London, where I used to budget for getting a bike nicked every 3 years. Things can be dodgy if you regularly leave a bike for long periods anywhere unattended, such as at railway stations or outside offices. Some people who do this regularly keep tatty old bikes especially for the purpose, and paint them with splodges to make them difficult to sell if stolen. A fashionable bike is more likely to be stolen than an unfashionable one. A lock is useless if you don’t actually use it, so some retro bikes come with what are known as nurses locks (because they used to be used by nurses making lots of home visits) These are part of the bike and can be set in seconds. They just lock one wheel. You can buy them as accessories for about 30 quid. But this is only useful for leaving the bike for a few minutes. For anything else get a stronger lock and use it. Cable locks are easy to use but very easy to cut. All bike shops sell locks and will advise. Folding bikes can be more secure if you can take them inside, but if the place will not let you in with the folder, they are very easy to steal if left outside. A front basket is nice, but to carry anything more than stuff from the corner shop or a small dog you need a back pannier. If not already fitted they will cost about £30. Don’t carry stuff on your back- it’s uncomfortable and unstable. Lights have improved massively in the last few years. Some retro bikes come with integrated lights which are handy, because they are difficult to steal. Otherwise you will need to buy some and take them off when you leave the bike. A chainguard stops you getting oil on trousers or legs. A skirtguard is a piece of plastic which goes over part of the back wheel to stop you getting your skirt stuck in the wheel. The whole idea of utility cycling is that you don’t have to wear special gear, but can wear your normal clothes so that you can integrate cycling into your everyday life, so these accessories can be very useful. Many retro bikes come with them, but you can fit them to most bikes. Each will cost around £30. Helmet and Hi vis jacket? In Holland, Belgium and Hull, where cycling is a commonplace day to day activity, no-one would wear these. Nor did other cyclists in the UK until recently. The fashion for helmets seems to have come from mountain biking where they are essential. But they are uncomfortable and have to be carried around or put somewhere when you are off the bike, which is not what utility cycling is meant to be about. A helmet will protect you, but so would knee and elbow pads, and most cyclists don’t wear these. Nor do pedestrians or front seat car passengers wear helmets, even though these activities carry high risks of head injuries. Similarly I’m not sure about the craze for high viz, which seems to be affecting everyone who does anything outdoors, although I would avoid wearing dark clothing, especially at night or on a dull day. By night reflective materials are good, but there is some evidence that these should be low down (ie on the bike or your legs) rather than on your back. One firm that specialises in children’s bikes is Islabikes. They are not cheap, but their quality and reputation means that when your children have outgrown them it will be easy to sell on. Folding bikes have a number of advantages: They can be taken on trains, even in rush hours, which is important for commuters. They can usually be taken on buses. They can be taken indoors at your destination to avoid theft. They are easy to store. But there are disadvantages too. Quite a few people find the ride is unstable and unsettling due to the low centre of gravity. They are difficult over rough ground or cobbles because of the small wheels. If you cannot take them inside and must lock them in the street they are very easy to steal. They are expensive. A folding bike will be about 30%/40% more expensive than a non-folding bike of the same quality. There are some real rubbish folding bikes around. You will be safe if you buy from Brompton (excellent but expensive) Tern or Dahon, who are all specialists. A to B magazine is the fount of all wisdom about folding bikes. Weight is important for folding bikes because sometimes you will be carrying them. Aim for 12 kilos or less. Try to avoid derailleur gears if you can. With wheels this small they are very vulnerable to dirt and damage.